While we were taking a break here at Booming Back, our friends over at netlabel Invisible Agent were releasing Selected ZoiDworks 05-12, from ZoiD, the electronica alias of Dublin musician Daniel Jacobson and the latest addition to their genre-warping series of album releases. I had a chance to listen to a pre-release version of the album when the good folks at Invisible Agent asked me to write up the album notes. The album is an eclectic and at times combatative fusion of jazz and electronica, that despite my natural aversion to the more esoteric "Hmmm. Nice. Smooth" chin-strokey elements of live jazz, I found myself really rather enjoying. 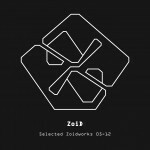 While the title alone is a clear nod to the groundbreaking AFX/Aphex Twin releases of Richard D. James, and those looking for squelchy breaks and glitchy beats with the occasional old school acid overtone will not be disappointed, Selected ZoiDworks 05-12 is so much more than a frenetic exercise in ambient electronica. Jacobson is a classically trained jazz musician, and from the opening bars of Aerosoul to the asynchronous beats of Particle Dither you are transported to the smoke-filled club of an improvising trio, though the free jazz notes they play were midwifed by a 303. Acid Leaves (with Bruce Morley) builds up to an acid rise and then subverts the expected break with a segue into a classical guitar riff that would not sound out of place on The Deer Hunter soundtrack, a theme continued on the soft yet driven Obelisk. The ambient East Morning Pier, the darker Bluesqueek and pulsing Cember, and the 8-bit exercise in glitchy thumps Munch would reject any attempt to classify them as jazz, but even here its tempo, breaks and styling continue as a noticeable undercurrent, though one evolved almost beyond recognition. The jazz/electronica path is one that is not well worn, perhaps because the cut-and-paste rhythmic regularity of a 4/4 laptop beat rarely plays well with the improvised fast-and-loose clashes of an off-tempo noodler. Where Brad Mehldau has drawn on Radiohead for his fusions, Jacobson has created something new and original, organically splicing the two with his own compositions, sometimes seamlessly, sometimes with a jarring dissonance, but always stronger than the sum of their separate traditions. A difficult task, but done with apparent ease. The album is available now on Bandcamp, Amazon, iTunes and a host of other places, more details about which can be found here, and you can listen to it below via the magic of Soundcloud.